palms and rock gardens that abound in this area. Before we depart we'll hike up to the ancient Indian cave paintings. Old missions and fresh water swimming holes? Yes, please! After our hearty breakfast we'll ease onto the old two lane road and settle into the Baja vibe. Our destination is historic San Ignacio. This small sleepy town is one of the most charming in Baja. Explore the town square and the old mission with it's thick volcanic rock walls. Take in a Margarita and some tacos and enjoy a dip in the lagoon. 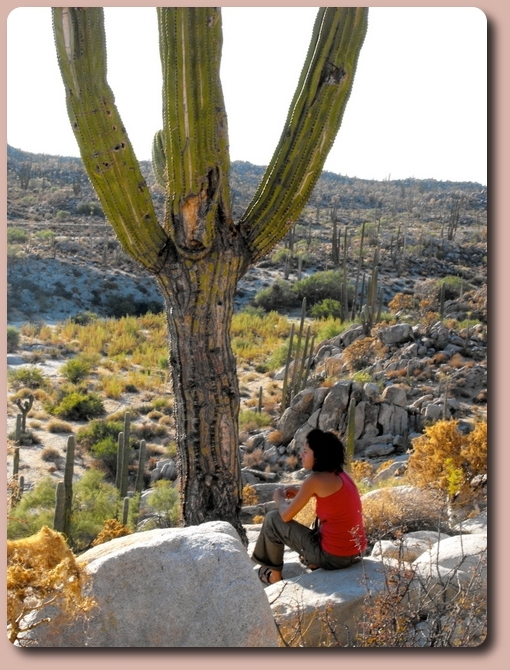 We'll cruise into the Baja oasis town of Mulege, on the Gulf of California. After a morning drive past the extinct volcanoes of Tres Virgenes and hundreds of palm trees, we'll explore the cobblestone streets, the museum and old mission. Choose to swim in the river or head down to the beach for some rays and sandy beach exploration. This is the sweet spot. By mid-morning we'll be lodged next to the largest bay in Baja - Bahia Concepcion. Here there are countless sandy beaches with clear blue waters. Take a kayak out and explore the coastline, islands and tide pools or just sit back and enjoy the scenery. This truly is a remarkable place. 70% Healthy Meals, Roundtrip Transport from US border, Etc. Let the warm Baja sun melt those blues away with a Sol Seeker experience. 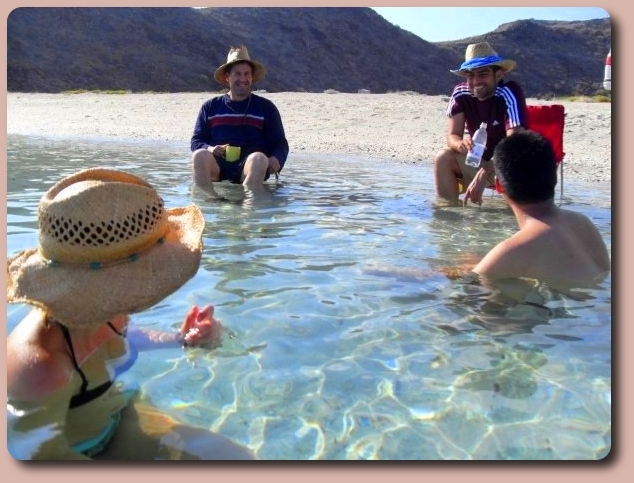 On this Baja Vibe trek we'll have a little bit of everything-including plenty of warm sun. It's all about beaches, having fun and taking it easy! "Wandering re-establishes the original harmony which once existed between man and the universe." We'll wind through the desert to our destination of Bahia de Los Angeles on the amazing Sea of Cortez. Exploring the Sea Turtle Rescue facility, museum and kayaking the bay is great fun. There are endless possibilities. Hike the mountains, go for a panga ride to see islands, dolphins and seals or explore the coast. At night, warm yourself by the campfire and gaze into the star-filled sky. 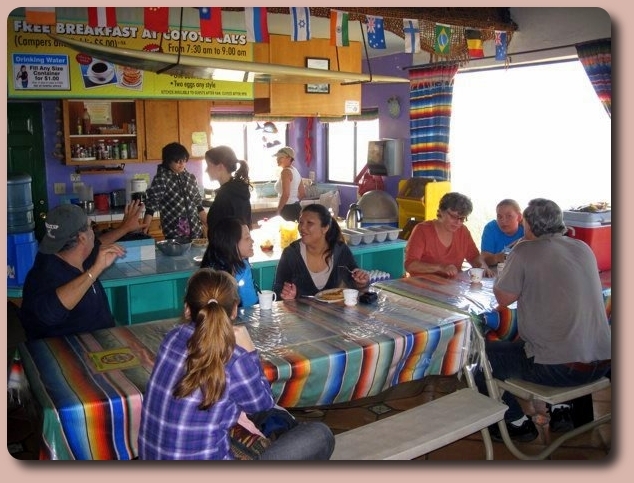 Following the Pacific Coast northward, we'll check in at one of our favorite hostels in Baja in Erendira: The legendary Coyote Cal's! On the way, we'll explore the El Rosario/San Quentin bay area. Enjoy the tide pools and quiet beaches for miles. We'll create a great Baja dinner at night, enjoy hot showers, and then hit up the Barefoot Bar and have a ping-pong showdown. Or just hang by the fire and lounge under the stars with the melodic rhythm of the Pacific Ocean keeping time. On our final day, we will drive up the craggy coast to Ensenada where we can sample the famous fish tacos, walk the town, and perhaps listen to a Mariachi band in Baja's oldest cantina, Hussong's. By the end of the day, we'll back to the border where we bid "adios, amigos" to our new friends. Good roads!